Jordan Flotation Storage Bed Group with Fast Free Shipping! The Jordan Storage Bed features a sleek contemporay style design featuring a storage headboard with three undermount lights. Features solid wood and ash veneer in capppuccino finish. (Does not include mattress). Mattress sold separately. Storage headboard in solid wood and ash veneer in cappuccino finish. This design features lighted storage headboard. Includes: headboard, footboard, sideboards. (Does not include mattress). Mattress sold separately. The Jordan Flotation System includes: bed as described above and 8" deep plush-top soft side mattress for a complete modern flotation system. Available in Queen, King and Cal. King sizes. 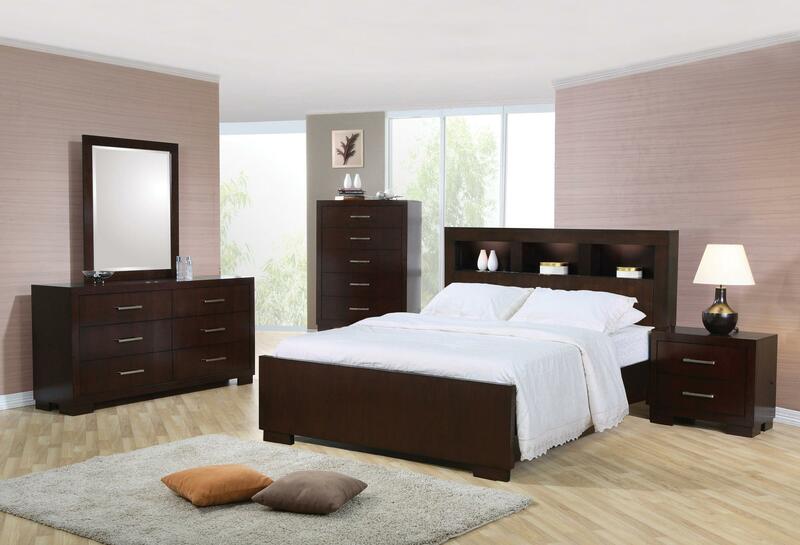 The Jordan Storage 4 Piece Set Includes: Complete Flotation System, Dresser, Mirror and one Nightstand. (Foundation not needed). 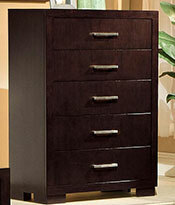 The Jordan Storage 5 Piece Set Includes: Complete Flotation System, Dresser, Mirror, Chest and one Nightstand. (Foundation not needed). 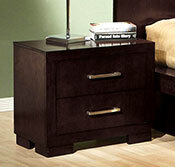 The Jordan Storage Bed Includes: Storage headboard with lights, footboard and sideboards. (Does not include mattress). Mattress sold separately.